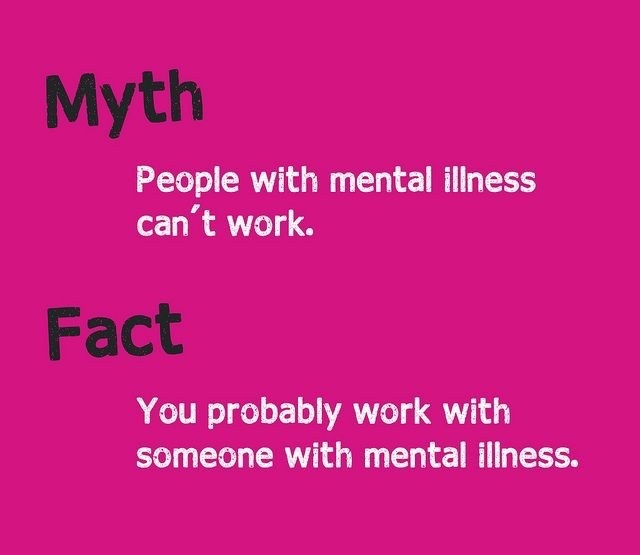 I posted the graphic above on my Google+ Website and got a response from an individual asking me for evidence or to explain a reference that “you probably work with someone with a mental illness”. I firmly believe that people all of the world that have a mental illness or mental disorder such as, but not limited to: bipolar, depression, generalized anxiety disorder, etc, have employment or are adult volunteers and are productive members of society. I have bipolar disorder and an addiction disorder and I have a full time job as a teacher and baseball coach. I know several individuals that I work with have been diagnosed with depression and anxiety. As a vocation teacher of students with unique needs, I seek gainful employment for students with disabilities and mental health disorders that are employed in valuable employment opportunities. Thank you in advance for your time. I know these questions may seem simple and obvious to most of you, but I wanted some data to include in my next response. – Mark C.
Do you work more than 5 people?? You probably do. Do you work for me?? Your boss has multiple mental illnesses. Awesome response! I love it! Not sure what the guy was thinking when he asked for a reference. I thought it was just common sense. Anyway, thanks for the response and have a good one! Mark C.
How about… students with a mental illness can’t graduate? I suppose YOU get that one. I’m the local go-to gal at my school for that one. I’m god with it. It’s frustrating that they have to ask if a kid can get a diploma simply because they have a mental illness…. however!!!! I’m happy that I am there to say, “Helllloooo” 🙂 it’s all good.